Nowhere in the world does the circle of life play out quite the way it does in Tanzania. On the Serengeti, millions of wildebeest and zebras roam the expansive plains in the great migration—crossing the Mara River in the Northern Serengeti despite the dangers that await. Gazelles, impalas, Tope antelope, leopards, cheetah, warthogs, elephants, giraffes, crocodiles, and lions: they’re all here along with countless species of birds including the ever-watchful vultures. What you see on a safari is part timing and part luck, but there are some things that are not to be missed like the three million-year-old Ngorongoro Crater, sunsets on the Serengeti, the great migration and the local tribal cultures. Tanzania is home to the Serengeti National Park, located on the northern border with Kenya. The park’s ecosystem is the oldest on the planet, boasting diversity of flora and fauna not found anywhere else. It’s also home to one of the world’s seven natural wonders—the Great Migration. During the migration seemingly endless herds of wildebeest and zebras roam the Serengeti plains from south to central to the Northern Serengeti. The movement is constant and you can witness it in various regions of the Serengeti throughout the year. But if you want to witness the wildebeest and zebras crossing the Mara River in the Northern Serengeti, plan to go in September. Crossing the Mara River is the migration’s most spectacular sight and also the most dangerous for the animals. 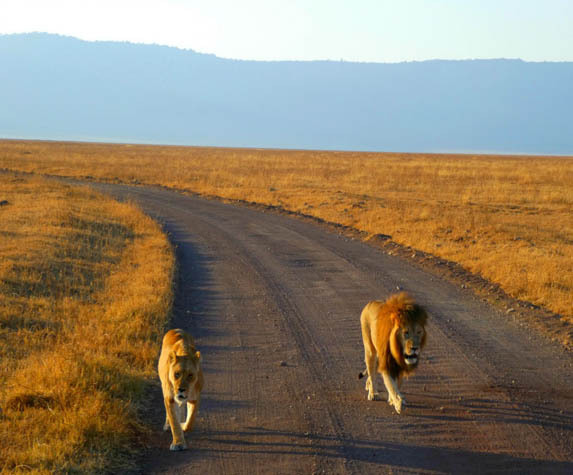 The Ngorongoro Crater is simply stunning. This massive cauldron formed from the violent eruption of a volcano three million years ago. The crater is home to more than 25,000 large animals including black rhinoceros, lions, elephants, cape buffalo, hippos and giraffes. Our early morning visit led to a close encounter with a lion couple out for a morning stroll. Near the eastern crater wall, hippos lazed about in the deep blue waters of the Ngoitokitok Spring. It was completely magical. The Sopa Lodge sits on the crater’s rim offering spectacular views and unforgettable sunsets. Be sure to keep your room door closed or the resident monkey population will rummage through your suitcase. When Victor, the owner of Top Guides Safaris told me he wanted to take our group on a hunt with the Hadza tribe, I wasn’t quite sure what to expect…but that’s never stopped me before. The experience—while bizarre in many respects—was a highlight of our time in Tanzania. We traveled deep into the bush to locate the nomadic tribe whose Hadzane click-language is unique to this tribe dating back thousands of years. Our translator introduced us to the men and boys who were playing embryonic instruments, chanting and dancing. They were as fascinated by us as we were them. And they were especially interested in taking selfies with our cellphones and watching videos of their dances. The younger tribe members interrupted the party to lead us further into the bush for the hunt. Armed with primitive bows and arrows they led the way as we followed along through a dry riverbed bookmarked by massive baobab trees. With surprising accuracy, the boys managed to track and shoot down a squirrel. They offered to cook it for us on the spot but thankfully, we were out of time. When you’re not out spotting wildlife, having a home base close by extends the safari experience. Camps like Kazkaz Mara on the Northern Serengeti offer luxuriously appointed tents with ample space, upscale furnishings and in-room bathroom facilities. Even better, they offer expertly prepared three course meals, fine wines and an entertaining, engaging staff. Sitting on your tent “porch” watching giraffes, elephants and zebras crossing on the horizon is one of many surreal moments in this remarkable country. And you really haven’t lived until your adventure includes listening to lions roar in the distance or baboons running across your tent in the night. Further south in Tarangire, the Maramboi Tented Lodge adds an infinity pool to the experience. Cool off in the pool, cocktail in hand, as zebras, wildebeest and warthogs have a drink in the water trough just beyond the pool’s edge. The Tanzania skies put on a show with an explosion of color in the daily sunrises and sunsets. As the sun rises, the soft pink highlights of early morning light make you happy you gave up that extra hour of sleep. You’ll want to get an early start anyway because the animals are more active early in the day. Morning is your best chance to see the lions munching on a kill from the previous night’s hunt—a sight that isn’t pretty, but one you certainly won’t forget. Late in the day when the sun begins to sink, the skies come alive with fiery shades of orange and red that vary each evening. And at the luxury camps, it’s time for a sundowner. The staff brings out the champagne and appetizers to celebrate the sinking sun with songs and dancing around the campfire—the perfect end to an already perfect day. Have you experienced the sights and sounds of Tanzania?